Richard III of England (1452–1485) was king of England from 1483 until 1485. He is remembered as a treacherous and ruthless man who murdered his way to the throne. Richard was the son of Richard Plantagenet, Duke of York and Cecily Neville, Duchess of York. Richard married Anne Neville. They had one son, Edward. During his reign, which lasted only two years, Richard was very popular in some parts of the country. However, there were many people who hated him. They raised a large army to confort him. He was killed at the Battle of Bosworth Field. He was the last English king to die in battle. 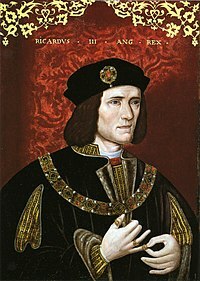 Richard III was followed to the throne by Henry Tudor as Henry VII of England. One of Shakespeare's earliest plays was a tragedy based on the life of Richard. In Shakespeare's play, Richard cries, "A horse! A horse! My kingdom for a horse!" as his enemies close in on him at Bosworth Field. This page was last edited on 11 January 2015, at 14:34.